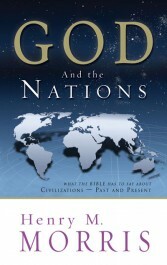 The past couple of weeks, I've been reading God and the Nations by Henry Morris. Published by Master Books, this paperback is fairly short (168 pages of text). I'll confess that it took me a little while to be really drawn into this. Morris starts off by talking about the start of 'nations' in the biblical record, and eventually gets up to modern day. Maybe I'm just on Tower of Babel overload, but that part of the book was pretty slow reading for me. Chapter IV: The Table of Nations is where I started to be more interested, but that was slow reading too just because there are so very many names in there. Beyond that, I was pretty well hooked. I particularly liked his descriptions of the mandates in the Bible and the discussion about how various nations (in history and in the present) are or are not carrying out those mandates. In the Bible, we see the interest God has in humans and their cultures. In the Old and New Testaments, the Hebrew and Greek words for "nations" occurs 720 times. Many of the nations that were given land and resources during Bible times have now passed into history, such as the Assyrians, Babylonians, and Hittites. We also know from secular history that civilizations like the Aztecs and Greeks are also largely removed from the scene. All this is due to those nations rejection of God’s laws. Indeed, of the 200 nations in existence today, only a handful actively seek God. I've enjoyed this book. You can find a preview of the book at the New Leaf Press website. And you can see what others had to say about it at the New Leaf Press blog. Summer of Service A.C.T.S. : Imagine! Reading Aloud Challenge: I'm back!